On another page, I talk about how you can and should take an active role in seeing that your subcontractors don’t make avoidable mistakes. Contractors, even the best ones, can and sometimes do make mistakes. You don’t have to be an expert yourself to spot these mistakes and to get them corrected while it’s still easy to do so. Here are some things you can double-check. Remember, double-checking is all you are doing. You’re not telling him how to do his job, so don’t worry that you’re stepping out of line. - Ensure that footings are within building lines as staked by your surveyor, and that they are oriented in proper direction. - Bottom of footings should be smooth dirt. No rocks, clumps, roots, or puddled water. - Rebar must be elevated, not laying on ground or just a few inches above it. 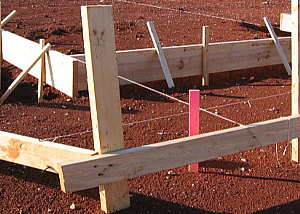 - Footings must be as wide and deep as called for on your foundation plan. - Take some overall measurements, width and front-to-back, to make sure the footings match the overall dimensions of the house, and that footings are where they should be. - Inspection requirements vary by area. It will probably be your responsibility to call for the footing inspection and verify that it passes.